This gorgeously handmade Noble Wine Cabinet is the ideal wine rack and display piece for all of your favorite wines. Organize and store your wine with grace and style (not to mention Amish engineering that is built to last generations). 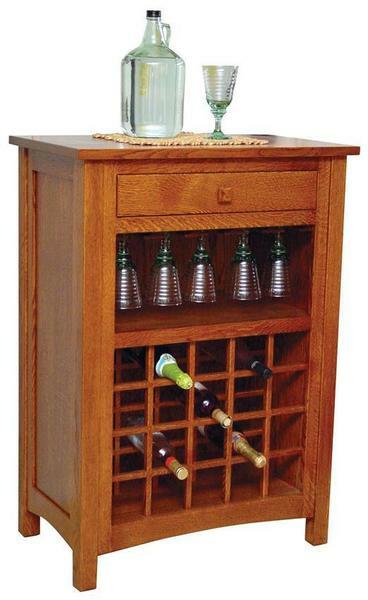 The solid wood design has wine slots for up to 20 bottles and a stemware rack to hold your best wine glasses. Also includes a pull out drawer for your cork screws and other wine accessories. This handcrafted Amish wine cabinet will look great in any room of your house and is the perfect piece to add some extra style to your home. If you're looking for a different style of wine cabinet, consider the Amish Wine Cabinet or the Amish Manitoba Wine Cabinet. Give our talented Amish furniture specialists a call today to receive additional information about this stunning handcrafted wine cabinet or to have us send out some wood and stain samples to help make your ordering process a bit easier.